Let's say I am trying to set up a variant product discount. Buy combine(laptop -16GB, 8GB & 4GB) and get 10% discount. A quick definition of how combine works. Combine: When multiple products are selected in the FROM field, this can be used to combine their quantity count in the cart. Example: Buy more than 5 quantities of A and B and get 10% discount on Product C. if 2 quantities of A and 3 quantities of B is bought (total 5 when combined), this rule will apply. Another useful option here is the Skip first X number of quantities. You can skip applying the discount to first 2 quantities of the products and only apply to the rest. Similarly, you can apply only to First quantities. i.e., limit to first 2 eligible quantities and the rest can be excluded from discount. Navigate to Woocommerce --> Woo Discount Rules. Here, select Price based rule and click on "Add new rule". You can give the below details. Order: Priority of your rule. Rule Name: Provide a rule name, here it is "Variant Product"
Rule Description: A two line description of your rule. Method : Select "Dependant product based discount". Validity : You can select date if you need to limit this discount for a particular period of time. 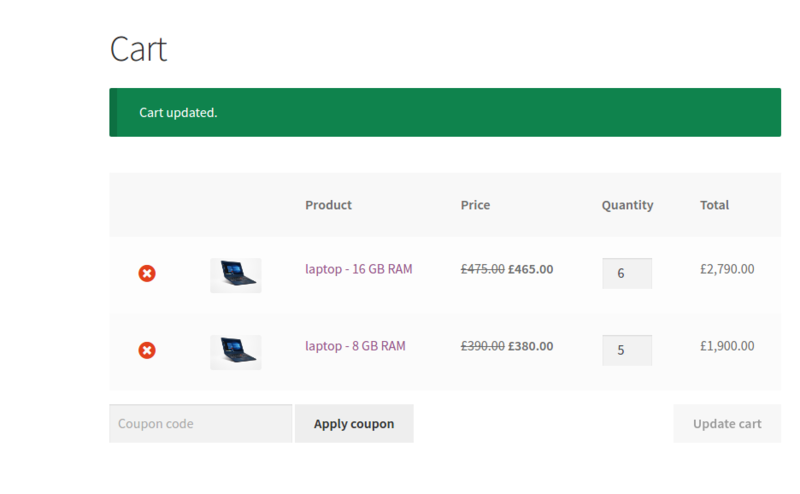 In the conditions tab, you need to specify for which product you need to provide the discount for. Here the rule is to give discount when any combination of the variant product is purchased above 10 quantities, then discount will be applied for all the variant products in the cart. Applying Fixed $10 discount for all the product variant combinations . The Rule applied with $10 discount for each product when 10 quantities of the variants are purchased. Check out few examples here.